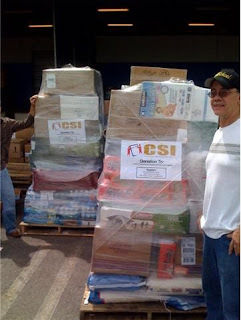 10:30 am - After Brian Fegter printed out the CSI posters/Address labels to be placed on the shipment pallets, head out to Miami to deliver the goods to Tropical Shipping. 11:30 am - Arrive at Tropical Shipping with truck, Van and Car loaded with goods.Unload goods onto Pallets and shrink wrap very tight. We ended up with 3 Pallets of goods, plus 8 extra boxes shipped individually (Cheaper) and 1 Suitcase. Total is: 12 Pieces (The 3 pallets and 9 individual pieces). 12:30 - Weighed items: 4,300 lbs.12:30 - Head to the office to pay. Since having worked the phones for 3 days trying to get the shipping taken care of, and having built relationships with the powers that be with Tropical, I told them we needed them to honor the "Special Rate" offered to us for taking goods down for relief. We had been given prices of up to $2,500.00 to ship all this goods!! After waiting for them to verify our claims and contact the chain of command we had worked with for the past 3 days, they did in fact, verify that my claim was true: only $2.00 per cu ft - all inclusive price!!! THANK GOD! TOTAL FOR SHIPPING OF ALL THESE GOODS: ONLY $544.00!!! PRAISE THE LORD! Photos were taken of all these transactions and of the loading process, etc. By 1:30 PM we were leaving the office heading back to the church. Ever since receiving the request by Bro. Scotty Slaydon, director for CSI on Monday, we have been running non-stop with a great team of volunteers from our church to make all of this happen. It has been amazing and tough work and yet so rewarding. I wish we could be there to help them distribute and set up the "tent city". The family of God, specifically the UPCI / CSI is such an amazing and wonderful organization! We are honored to be a small part of such a great need.